This 8GB MP3 Player contains five proven effective, high-quality extended-play snow goose e-caller sound tracks created from my personal recordings of 100% WILD SNOW GEESE. Each extended track plays for approximately an hour. Excellent for spread units or just long, uninterrupted sounds. No more fumbling around for the “repeat” button when a flock is just about committed. The MP3 Player also accepts a MicroSD card for additional storage and playback options. 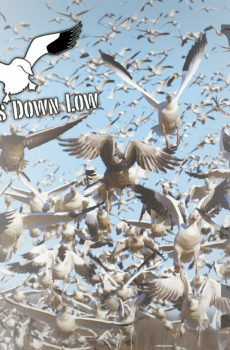 All Snows Down Low sounds are 2-channel stereo featuring left and right channel individual calling geese with a centered up main sound bringing it all together. Each track has a unique sound and cadence, so you’ll always have just the right sound for any hunting situation.